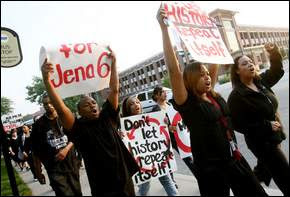 About 100 students marched on the campus of Ball State University this morning to show their support for the "Jena 6," high school students in Jena, La., facing criminal charges in the beating of a white classmate. With individuals holding signs that read “Free Jena 6” and “Don’t let history repeat itself,” the group began the march at 8 a.m. at LaFollette Field and ended at the Student Center off University Avenue. Ebony Strong, president of Ball State’s Black Student Association, organizers of the march, said she was pleased with the turnout at this morning’s event. Nationwide, similar rallies and marches are being held today to protest the criminal charges against six black high school students charged with crimes related to their alleged involvement in an assault of a white teenager in Jena, La. late last year. Meanwhile busloads of people are converging on the small town in Louisiana at the center of the controversy. They're coming from Detroit, from North Texas, and lots of other places too. There's more media coverage than you would expect. Here's a report from Canada's National Post. I may be back with more later; in the meantime please feel free to post your own links and thoughts.